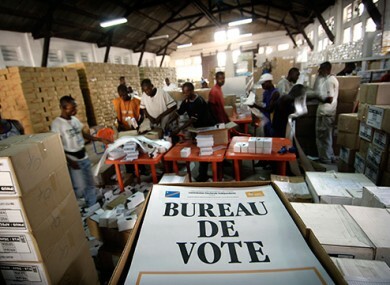 Haiti Election: Too many candidates too many international observers. The Caribbean Community (CARICOM) will mount an election observation mission to oversee the first round of the Presidential elections between some 50 candidates and the second round of legislative elections, which will take place this Sunday October 25th. The fielding of this mission comes at the request of the government of Haiti and follows the presence of CARICOM election observation missions in St Kitts and Nevis, Guyana, Suriname and Trinidad and Tobago. It should be noted that CARICOM is the not the only multinational institution which the Haitian Government has asked for help to oversee the largest election in the country's history. The UN, OAS, EU and numerous other non-governmental organizations will help monitor the electoral process around the country. Even though these organizations show great willingness to help Haiti through one of its most important democratic transitions; their interests might once more be self-serving; as we have seen too many times in the recent past. The continuous involvement of the international community in Haitian elections will keep undermining the democracy that they pretend to promote, while suffocating the real change Haitian needs. The vote of the people of Haiti are not accorded the same sanctity that Western nations accord to their own. They completely disregard the will of the people and hand pick candidates that will best serve their interests. The elections in Haiti have always been rigged with irregularities and have always been contested. Why? Because the international community has been unable to stop its obsession about meddling in every country's business. As the latest email-publication of Hillary Clinton then US Secretary of State's have shown how the United States through the State Department and the OAS (Same one which will oversee this year's election) forced the Haitian government to change the results of the 2010 presidential election by blatantly removing a candidate they did not like. The mission of an electoral observer is not to prevent fraud, but rather record and report such instances. The electoral observers are usually either directly involved or are a behind-the-scene hands. I do not want to sound like an angry dissident, but past elections in Haiti have not left great attributes to brag about. This election with less or about 10 % turnout is just a political charade to mask the catastrophic failure of the International involvement in Haiti; especially since the 2010 earthquake. Virtually nothing has been rebuilt, there are still about 80.000 people living under tents, the Cholera Epidemic introduced to the country by UN soldiers is still ravaging the country after taking the lives of nearly 10.000 and sickened hundreds of thousands more; tens of thousands Haitian and Dominicans of Haitian descent are being deported to Haiti by the Dominican Republic. Haiti does not need another electoral observer. An observer of the failures maybe? Well we have enough of them already too.